The Pentagon Memorial Chapel Window is unique in its creation and symbolism. In November 2001, the Army Chaplains Office contacted IHS Studios to design and craft a memorial window for their new interfaith chapel. IHS Studios team of artisans donated their time and expertise to design, provide materials and cut the intricate pieces of glass. The window design form and the pieces of glass were then shipped to the Army Chaplains Corps' Senior Leadership Training Conference. Some of the very same chaplains who ministered to the injured and grieving after the Pentagon attack assembled the symbolic window by hand. It was presented to the Chief of Army Chaplains Major General Gaylord Gunhus on Thursday, March 7th, 2002. The window will be placed in the Pentagon's new Memorial Chapel adorning the newly reconstructed side of the building that was destroyed on September 11, 2001. The pentagon shaped window links together the five military branches that guard the Nation. The American Bald Eagle is in a vigilant stance, symbolizing the past and present generations of those who defend our country. The flag is displayed upon alternating rays of green and gold, which portray the dark trials and bright triumphs in our history. The Pentagon building represents the undefeated bulwark at the heart of our defenses and the more than 23,000 men and women who contribute to the planning and execution of the defense of our country. The olive branch reveals the national character: always desirous of peace while ever prepared to defend freedom. The two crimson rings total 184 individual pieces of glass, which recall the loss of military and civilian lives. 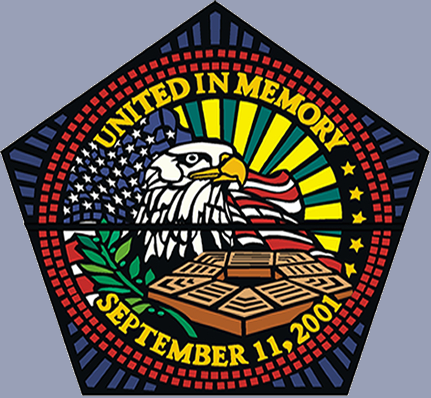 The inscription "United In Memory," in glowing amber, remind all that the Nation is One in recognizing the sacrifices of those who died in service to the Republic. The date of September 11, 2001 speaks that our national resolve is unwavering in memory and in commitment over the forces of evil.